Mary was the mother of Jesus. 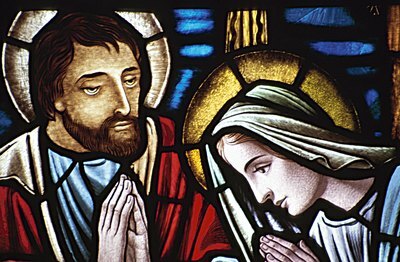 The Christian faith believes that Mary conceived Jesus through divine intervention, meaning she was impregnated by the Holy Spirit. At the time Mary was betrothed, or engaged, to Joseph. She later married Joseph and journeyed with him while pregnant with Jesus to the city of Bethlehem, where she gave birth. 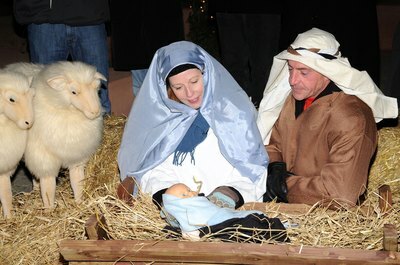 To dress up like the Virgin Mary for a costume party or nativity requires very little craft skill. Mary dressed in simple garb, so you can usually find all you need in your closet to make the costume. The Virgin Mary is commonly depicted wearing a long white gown, or robe. The garment should be loose fitting. It should be cinched at the waste with a rope or cord. To make a robe, take a white sheet, fold it in half, cut a hole in the fold for your head to pop through and put the sheet on so half covers your back and half covers your front. Then tie a piece of gold or white rope, or cord, loosely around your waist. 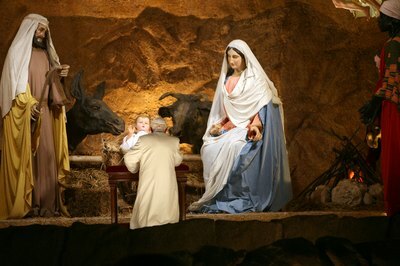 Images of Mary usually show her wearing a long blue veil or cape over her white robe. To create this look, use another sheet in a shade of light blue. A smaller sheet sized for a crib is preferable. Place the sheet over your head without covering your face. The length of the blue sheet should fall to your back and sides. Secure the blue sheet on your head with a few bobby pins. Footwear for a Virgin Mary costume should be simple. Sandals work well. Choose a pair in a neutral shade of brown. Footwear made from leather would look authentic for the time, but faux leather sandals work for a Mary costume, too. 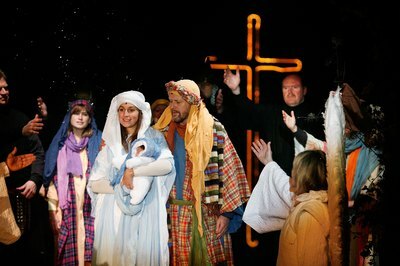 To accurately depict the Virgin Mary, you should incorporate Jesus into the costume. Carry a newborn doll or use a pillow to create the illusion of pregnancy. The doll should be wrapped in a cloth or blanket. The cloth or blanket should be a neutral shade of tan or brown.